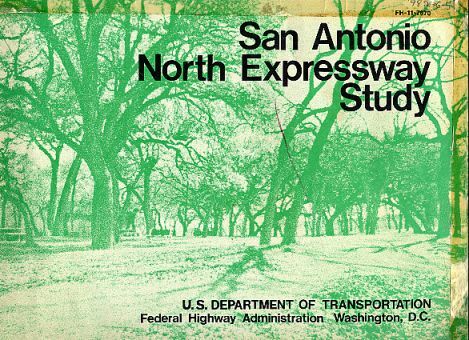 The North San Antonio Expressway, now known as the US 281 McAllister Freeway, was Texas' most controversial freeway. While other freeways such as the Koening Lane/2222 Freeway in Austin and the Harrisburg Freeway/225 in Houston were also highly controversial (and were both cancelled), no other freeway in Texas can come close to the long-running litigation, controversy, and legislative backroom dealing to get the North San Antonio Expressway built. The freeway was opened on February 7, 1978. At the time this study was inititiated in December 1970, litigation had escalated all the way to the Supreme Court of the United States. The San Antonio Conservation Society had attempted to stop the Texas Highway Department from moving forward with the project. The Conversation Society lost a court ruling on November 12, 1970, when the U.S. District Court refused to stop the project. The Conservation Society submitted a writ of certiori (request for review of the lower court decision) to the Supreme Court of the United States. The writ of certiori was denied by the Supreme Court in a 6-3 decision, so the lower court decision stood for the moment. But the story was far from over. Approval of the middle section of the freeway route by the United Department of Transportation was still needed. The Department of Transportation authorized and paid for the study that is the focus of this web page. The project history after 1970 is described in the San Antonio Area Freeways 281 information page. To briefly summarize, a May 1971 federal court ruling stopped the project and revoked federal funding. In 1972, the Supreme Court upheld the lower court decision, putting the project near death. In 1973, Texas Senators John Tower and Lloyd Bentsen sponsored legislation that allowed the project to be built without federal money. The legislation was upheld by the courts, and construction on the controversial center segment was underway by the end of 1974. 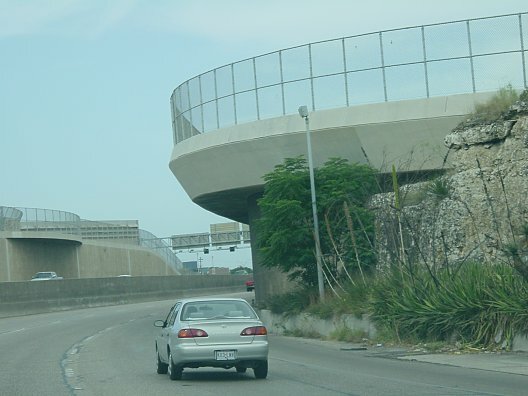 The San Antonio Conservation Society appears to have been the principal force driving the litigation against the freeway. 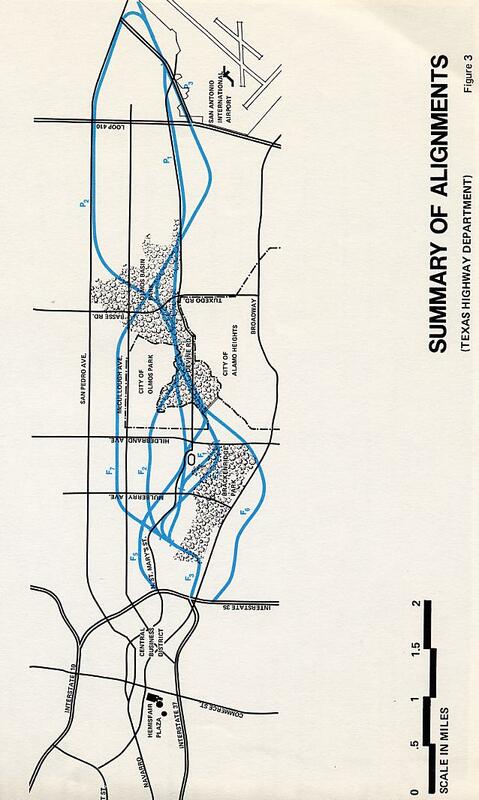 Although I can only speculate on the relationship of the San Antonio Conversation Society to the national anti-freeway movement, it's safe to assume that the San Antonio Conservation Society was in agreement with the following assessment of the freeway that appeared in the 1970 anti-freeway book Superhighway-Superhoax, written by Helen Leavitt, who lived in Washington D.C. The text below is taken from pages 16-18 of the book. To avoid this onslaught of more automobiles, we must stop building freeways and obliging automobile traffic in areas of dense population. We must stop listening to engineers and highway planners, men who explain the effects of displacing people and services in very vague terms. Even more vague, in the mind of the highway planner, at least, is the direct social or economic effect of taking a park or wildlife refuge for highway use. Since highway designers and planners equate cost-benefit in terms of dollar value, it becomes a sticky problem to measure the utility of, say, a public golf course or a bird sanctuary. But they have been convinced in the past they they could prove such public land is less valuable than a highway which destroys it. Else why would the state and federal highway officials approve a plan to construct a freeway like the North Expressway through the historic city of the Alamo, San Antonio? The center of this city enjoys a park and a natural landscape complex virtually downtown which consists of open spaces, college campuses, a river, zoo, golf course, and flood basin. Now let's see what the highway planners designed for this Texas city. 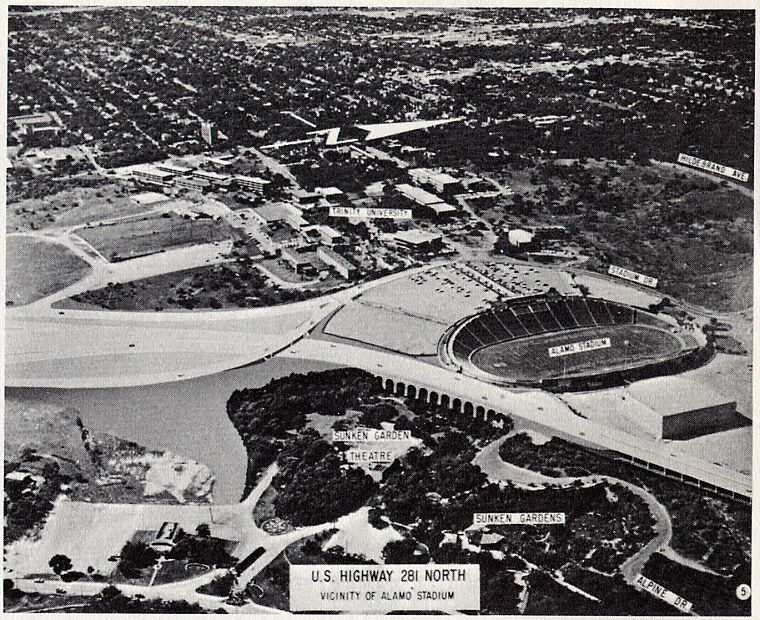 As proposed, the expressway is to curve and wind its way across the Audubon bird sanctuary and Olmos Creek, a tributary in its natural state which would be converted into a concrete ditch, on and along a picnic ground and recreation area, wiping out a Girl Scout Day Camp and nature trail, rise across the Olmos Basin to the height of the Olmos Dam, where it would cross, sever a college campus, force an elementary school to close, pass through the zoo, block off the public gymnasium, follow the edge of the sunken gardens, past the outdoor theater where it is squeezed between this and the municipal school stadium, blocking a major entrance, entered residential San Antonio, taking homes, swiping off part of a municipal golf course, and limp home through a wooded portion of the San Antonio River's natural watercourse, one of the few remaining wilderness areas left in the city. This is a classic example of highway planning. In other cities with expressway controversies, the fight has centered on demolition of a park or disruption of a neighborhood or the severing of a campus or the bisecting of a zoo or of a golf course or the loss of a school or treasured trees. Here, San Antonio has the dubious distinction of falling victim to all of the typical hazards of highway planning. 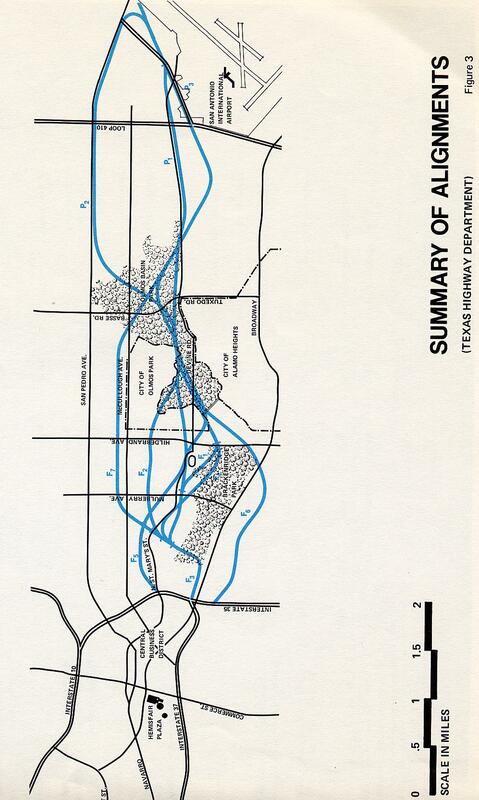 Clearly, the planners of San Antonio's North Expressway did not know where NOT to build. It was only after years of pressure from numerous citizen groups that the Bureau and state highway officials agreed in 1969 to consider tunneling portions of the expressway. At this writing no commitment has been made to tunnel. Few freeway proposals will do more damage to environment, housing, recreation, and cultural interests than the expressway as originally scheduled for that delightful Texas city in 1966. Where is the federal-state highway partnership which the report assured us was even then devoting a much greater share of its time and talent to the human values involved in the highway program? In 2001, I'm pleased to report that San Antonio is a better place because the North San Antonio Expressway was constructed. The neighborhoods, universities, and parks are all doing fine, maybe even better than ever. And one reason for this is because traffic is funneled onto the freeway, rather than through the neighborhoods and parks. So wherever you are, Helen Leavitt: you where wrong! To study and analyze feasible and prudent alternative route locations to the 2.7 mile middle section of the Adopted alignment between the presently designated termini at Mulberry Avenue an Tuxedo Avenue. 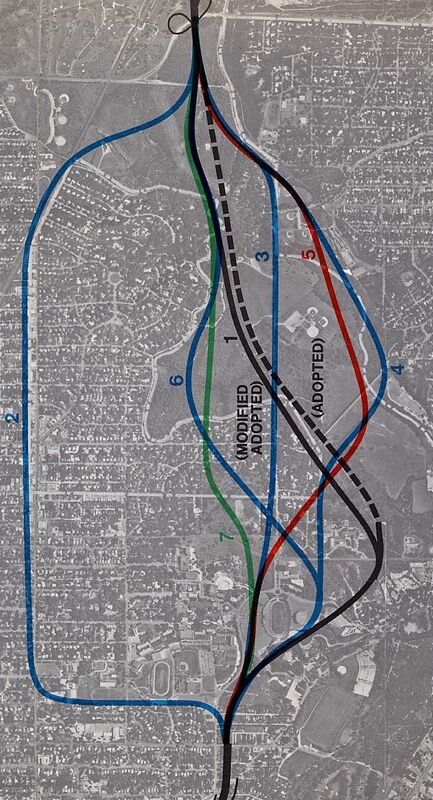 To study and analyze means by which the Adopted alignment can best be blended into park lands it crosses, if no other feasible and prudent alternatives are found to exist. This study recommended a route different than the actually constructed route. But what is most fascinating about this study is some of the photos that it includes, especially the elevated freeway with Roman-esque arches that was originally planned for the section near Sunken Gardens. This map identifies the controversial section of freeway that was under study. (high resolution 308k) This map shows all the alternatives that were considered for the full corridor from downtown to the airport. 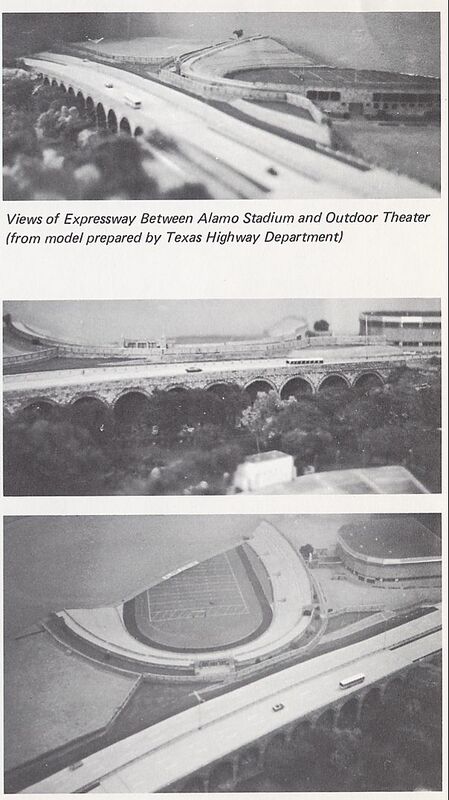 These alternatives were presented to the City of San Antonio in March 1960. Route F3 was considered superior by the Texas Highway Department. Although not clear in the map below, it is the route that passes just to the west of the stadium (the oval) and then proceeds directly northward. However, this route passed through the city of Olmos Park, which did not want the freeway. So route F1, entirely within the city limits of San Antonio, became the adopted route. As we will see, this study also recommends a route very similar to F3. (high resolution 168k) In December 1969, the Secretary of Transportation John Volpe approved the end sections of the 281 alignment, shown in blue. As a condition of the approval, the controversial middle section shown in red would be further studied. Hence this study. This view shows the alignments that were considered in this study. The recommended alignment was the green alignment. Alternatives 4 (left) and 5 actually included options where the freeway would run parallel to the dam inside the flood plain. (high resolution 170k) This view shows some of the facilities that would be impacted by the proposed freeway. 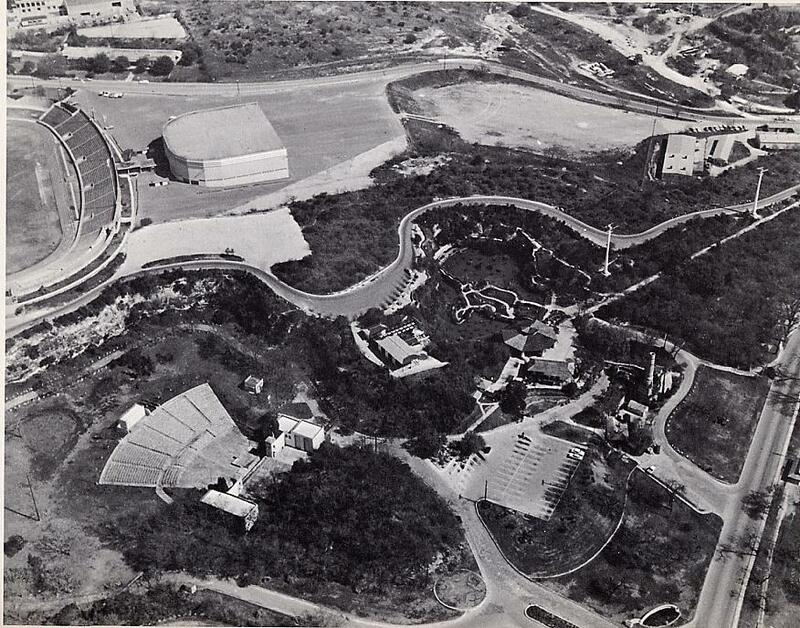 At bottom left is the Sunken Gardens Amphitheater; at middle right is Sunken Gardens. 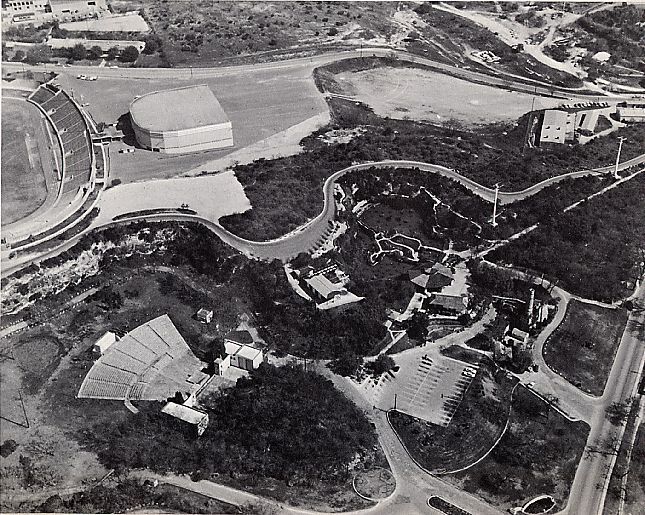 At the top left is the stadium and gynmasium. The freeway was in fact built right through the location of this photo. 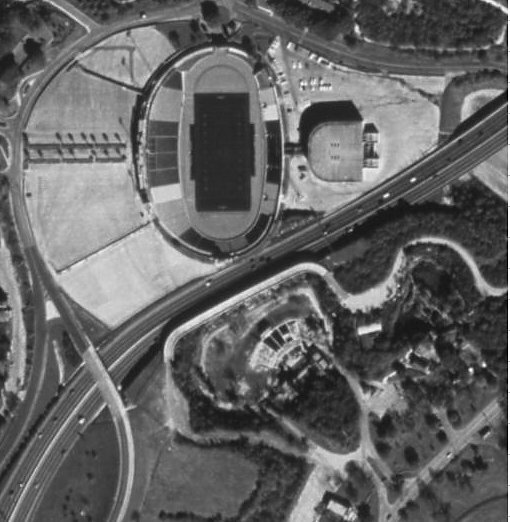 This 1995 aerial photo shows where the freeway was actually constructed. This 2001 driver's view looking north shows how the freeway was squeezed between the stadium and Sunken Gardens Theater. This fascinating photograph shows a model of the originally proposed freeway in the location of Sunken Gardens. The freeway was to be elevated on a viaduct. Adjacent to the outdoor theater, the viaduct would have Roman-esque arches to serve as a visually pleasing backdrop to the theater. (high resolution 318k) This image shows three more views of the arched viaduct. This view shows the planned freeway through the Olmos Basin flood detention area. Notice that this plan shows the freeway on an earthfill embankment, not a viaduct. The disruption caused by the excavation of embankment from adjacent areas was one of the major objections to the original plan. (high resolution 281k) This view shows the roadway on top of the Olmos dam before the freeway, and an artist rendering of the freeway crossing the dam. The recommended alternative of this study, the green route, cut a path through Trinity University property. 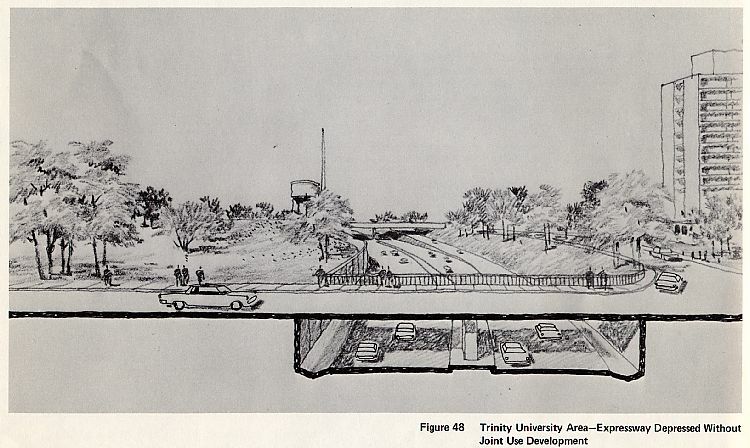 These artists depictions show two options for the freeway through the university. The upper option is a depressed freeway without joint use development, and was recommended in this study. The lower option shows possible joint use development with the freeway in a tunnel. As stated at the outset of this report, the analysis and evaluation has been heavily weighted toward the preservation of park lands, with concern not just for currently actively used areas, but for the entire park area and its future potentials. In the final analysis the man-made facilities, both within the park and in the areas adjacent, must be considered replaceable. What is not replaceable is the delicate balance between the natural environment and the imposition of man-made facilities. A critical question is: at what price can we no longer afford to maintain our natural environment? On the other side of the ledger is the impact to the areas outside of the park lands, assuming a route is selected which follows such a course. The displacement from one's dwelling to make way for a public facility cannot be taken lightly. At the very least, those displaced must be fully compensated, and those left adjacent must be fully protected from any impact. If, and only if, these conditions can be met, and alternative that encroaches upon residential areas can be considered. Such an alternative has been formulated. 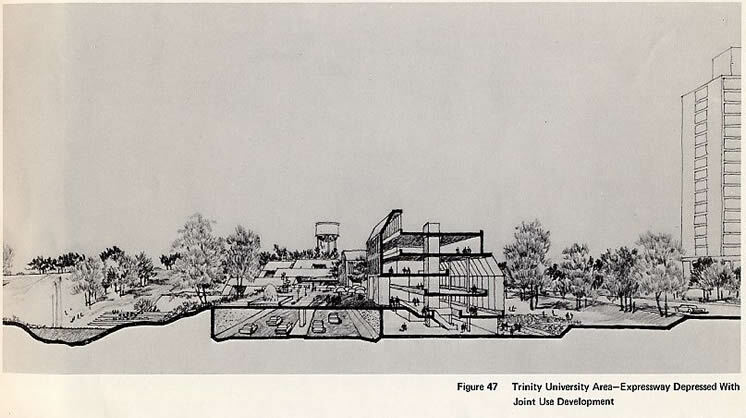 Through judicious design, the Green alignment or its variation (the alternative Green alignment which assumes no joint use with Trinity University) can succeed in traversing residential areas with a minimum of impact. The same alignment would minimally encroach on park lands. Depending on the willingness to expend funds, this alignment can be virtually hidden from both the residents of Olmos Park and the users of Olmos Park Basin. However, its accomplishment is no simple matter. 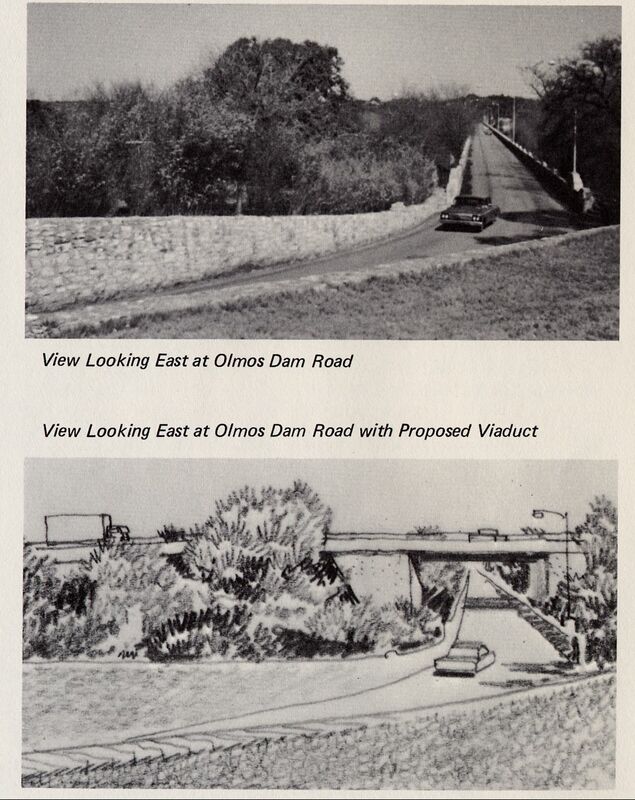 The opposition of the City of Olmos Park must be overcome, the legal and financial implications of deviating from the Adopted alignment must be resolved, and, perhaps most difficult of all, the various affected parties - the Department of Transportation, the Texas Highway Department, the Cities of San Antonio and Olmos Park, Trinity University, the School District, and all of the other various interest groups - must pull together in a bond of common interest. Well, there definitely was not a bonding between parties involved, as litigation ultimately went to the Supreme Court. The Texas Highway Department ultimately built the freeway on the originally adopted route, but the final design did include measures that are more friendly to the environment, including depressing the freeway in the region of Sunken Gardens and building the freeway on viaduct through the Olmos Flood Control Basin. Clearly these were necessary improvements to the original design. The North Expressway is a unique driving experience in Texas as it passes through a native, park-like environment in an urban area. Over 140,000 vehicles per day can now enjoy the park.